Christmas morning, after the excitement died down, the kids were playing with their new toys, and I sat down with my coffee, it occurred to me that over fifty of my house portraits were being gifted that very morning in houses near and far. It was a really special feeling knowing I was a small part of Christmas morning in so many homes. Thank you to all of you! 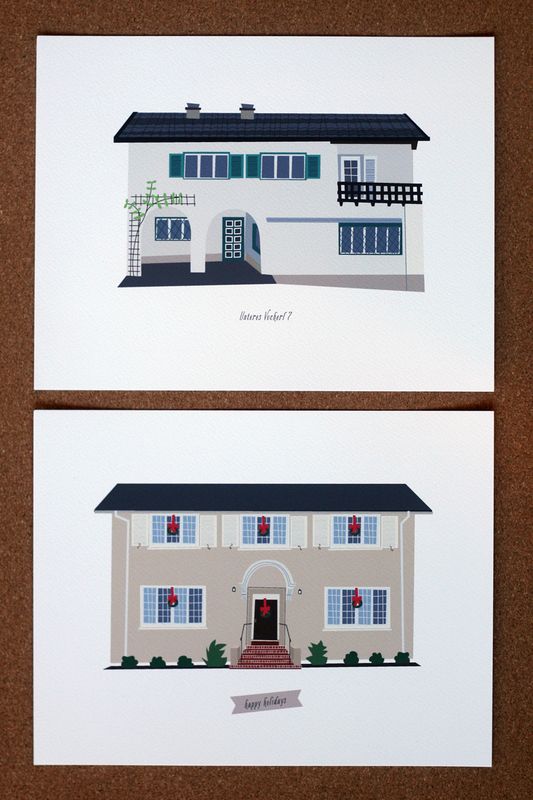 Despite the rushed feeling of it all, I illustrated some of my favorite houses in the past month. I didn't get a chance to photograph any until just yesterday. These are some couples I thought looked cute together. I just can't resist photographing them in pairs. I even illustrated a car! Fun stuff. Right now, I'm working my way through the waiting list and hoping to open the shop to new orders in February. Woohoo! Thank you for all the House Lovelove. Truly.